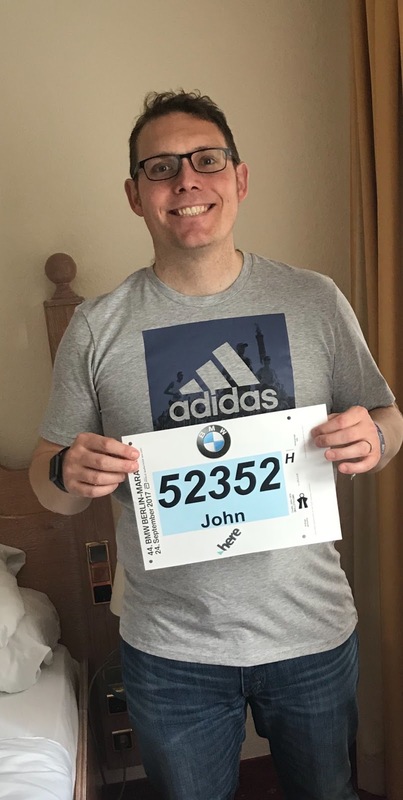 This weekend Kath and I headed to Berlin Germany so that I could take part in the 44th Berlin marathon. We flew out on Thursday night after I finished work, taking an EasyJet flight to Berlin Schönefeld airport. From there we bought a train ticket and took the S-bahn then U-bahn trains to our hotel the Berlin Mitte located two U-Bahn stops from Potsdamer Platz. The Marathon Expo was being held just opposite the hotel at Station Berlin so it made picking up my number really easy. The Expo was full of clothing, displays of different marathons all over the world and some assorted oddities. Main sponsor BMW had plenty of cars to show off, they were big on electric and hybrid vehicles, including a rather tasty i8 safety car for the marathon. 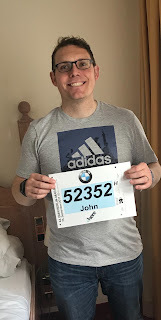 The Marathon was on Sunday, I was pretty apprehensive about it as with the house move and general life which seemed extremely on the go over last 6 months, meant that I trained less than for the previous marathon in Manchester. So much so that I was worried that I would have to walk for significant portions. Fortunately with the crowd and some help from the multipower and sugar high drinks handed out every few miles I managed a reasonable 4:42:34. It is 12 minutes slower than Manchester but still I think respectable. The last 10km were at times the toughest I have done with my whole body feeling tired, I just about managed to keep going by doing a fartlek. The last 500 meters took me under the Brandeburg Tor to the finish line was simply a blur! At the end I got my medal and downed a Erdhinger alcohol free beer (erm I mean isotonic drink). There had been a place about 1km from the end of the race handing out shots of Jagermeister but I didn't partake, not sure that I would have made it to the end. Kath, Anya and Sylvio were waiting for me at the end, it was great to see them but I was s exhausted I could hardly speak. Anya provided delicious high protein sandwiches which definitely made the recovery easier. After a quick trip back to the hotel for a shower we headed out for dinner. They took us to a traditional beer halle where the staff wore Bavarian outfits. It is just before Oktoberfest so we celebrated with 1 litre steins of beer and I had some currywurst. The day after the marathon I was feeling very delicate, my legs turned to jelly, descending stairs proving especially difficult! Kath and I headed into city centre a final time to get a band engraved with my time at the Adidas store then a final meal before heading back home to Manchester.